Summer is coming, which means so are the al fresco beach dinners. 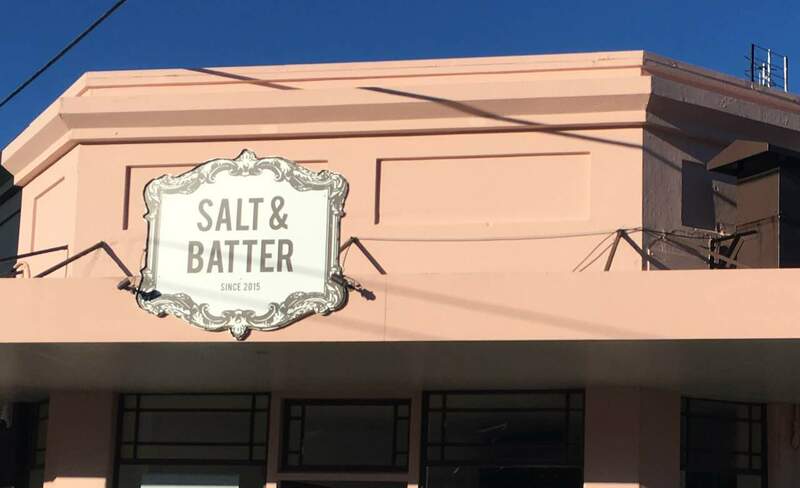 If you're after a sunset-lit fish and chip dinner on the beach, heralding the start of summer, Salt and Batter should be your first stop. Centrally situated on the Parade in Island Bay, it's well-situated for sitting outside in the early summer sun while you wait on your order. Salt and Batter takes the classic fish and chip shop menu and adds touches like chip sammies ($1), mushy peas ($4.50) and Jelly tip trumpets($2.50). And if you're so inclined, they make it easy to dial down on the fatty foods and replace the deep fried with fresh coconut-marinated fish ($7), garlic chilli prawns ($7), summer rolls ($7) or their four salads of varying ingredients and influences. ... Let's be real though, don't pass up one of the creme patisserie-filled waffledogs ($2.50). The fish used changes nearly daily depending on demand (terakihi and warehou were the order of the day of my visit, alongside fresh whitebait). The classic battered or crumbed ($5) will see you right. If you're looking for awesome value, don't go past the fish dinner- $15 will get you a fish fillet (usually $9), chips, lemon, tartare, buttered white bread sammie and choice of salad. After you've picked up your order, make your way to the nearest beach and unfurl the picnic rug. Princess Bay, a five minute drive away is the perfect spot to watch a sunset.